'Zionist Union' faction launches counter-campaign following shelved negative campaign planned in Likud against senior Zionist Union figures. The "Zionist Union" party today (Tuesday) launched a counter-campaign against the negative. ultimately shelved, campaign against senior Zionist Union members that was planned by the Likud on the eve of the last elections. In the picture distributed today by the party, a photo representation of Yitzchak Rabin appears wearing Arafat's kaffiyeh, a reminder of the period of protests against the Oslo Accords, alongside a photograph of Labor party chairman Yitzchak Herzog from the shelved Likud campaign. The poster of Rabin turned out to be the work of a provocateur. The two pictures are displayed side by side under the title "Bibi's Method". 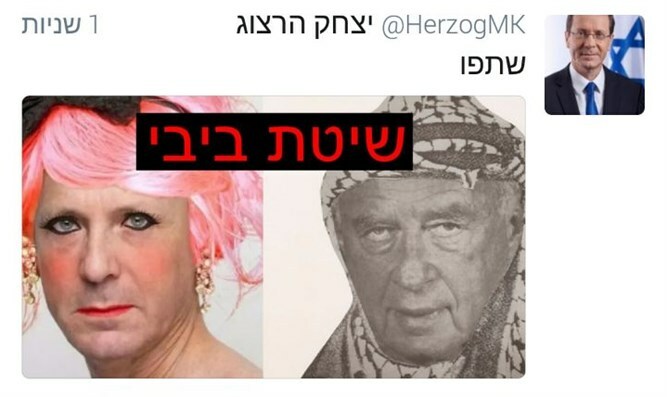 The Chairman of the Zionist Union, Yitzhak Herzog, shared the collage on his personal Twitter account. Haaretz reported yesterday that in the Likud a "guerilla campaign" was prepared before the last elections, which was supposed to run parallel to the party's official campaign, but was eventually shelved. The campaign included an election poster that presented the chairman of the Zionist camp, Yitzhak Herzog, as a woman. In order to prepare a poster designed to ridicule Herzog and his non-aggressive image, a Yanai Yechiel photo of Herzog from a Haaretz magazine supplement published in 2013. The Likud added makeup, earrings, blonde wig, and bow, with the caption "makeover".